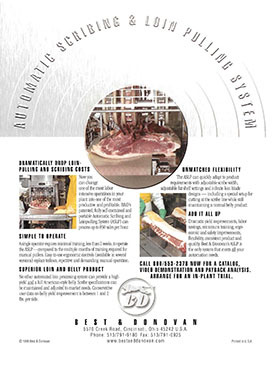 B&D's patented approach to capturing, positioning, straightening and pulling loins is state-of-the-art, and has proven to dramatically improve the yield of each loin and belly. B&D's "no-nonsense" technology will deliver a consistent and predictably higher quality product than any other pulling/scribing system. In fact, our patented system is the only option!!! Why tie your production and sales possibilities onto traditional loin pulling or "European" style pulling when B&D's loin pulling systems can do both. Systems are also self-contained and portable so "tight space" in the cut room is not a serious problem. Packer proven and thoroughly tested, the B&D loin system will deliver quality pulls, accurate scribes and high yield bellies and loins day after day. Our loin pulling systems are capable of up to 850 pieces per hour, per side. Operator has simple task of manipulating a joystick rather than the strenuous job of pulling loins. Traditional manual loin pulling is an art that takes nearly 6-10 weeks for an operator to learn effectively. With B&D's loin pulling system, an operator can be trained in less than 2 weeks.